Does That Come With a Swizzle Stick? Every year, although I reassure him it’s not necessary, Hub insists on taking me out to dinner for my birthday. After several weeks of holiday parties and over-indulging and way too many nights away from my comfy perch. 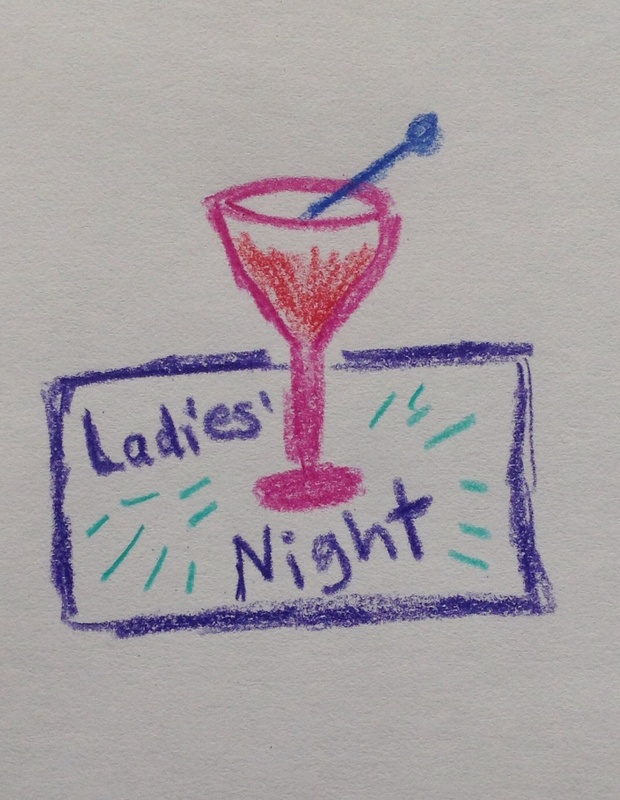 This year, in lieu of dining out, he bought tickets to Ladies’ Comedy Night at Miner’s Alley, a teeny tiny theater in Golden, Colorado. I wasn’t sure he realized that meant THE CROWD would be ladies, not just the comedians. Sure enough, when we walked into the theater, the cacophony of voices was decidedly high-pitched. We spotted three vacant seats in the middle row (there are only five rows) and sat down. To the left of us – a group of women complaining about work. Behind us – three women yakking about their kids. In front of us – two women loudly discussing their post-divorce status and luck (or lack thereof) on the local dating scene. “You ok?” I asked Hub. “Sure”, he smiled gamely, his eyes searching the crowd for signs of testosterone. Hub turned to me, arched his eyebrow, and we burst out laughing. Should I be worried that Hub bought himself a season ticket to Ladies’ Comedy Night? May I Have a Refund, Please? Thank you. It was a fun evening – and that was BEFORE the comedians started !! Glad to know the hyperlink worked!! Progress. Have a great weekend, Tina. Lainey – you never look like spam 😉 Thanks for the award nomination; you are so sweet. I already got nominated by another blogger last week and haven’t had time to do the work on it yet. But that means I have to turn yours down. I’m going to visit your site this weekend because I want to see your questions 🙂 Congratulations on getting the nomination yourself!! Love your post excuse my ignorance but did it come with a swizzle stick ? You know, I can’t remember LOL I was so dazzled by Casey and her question and laughing and I forgot to look at the drink !! Do you know what a swizzle stick is? So the Queen’s a nipper, eh? My niece recently moved to London and has a very funny blog where she recently posted about seeing the Queen while niece’s parents were visiting. Too bad you couldn’t join them. She posts on Quora; you need to register, etc. to read; if interested, let me know and I’ll email you with more info (or I’ll try to email you that post).